A dozen restaurants in the city and beyond that make a perfect pie. 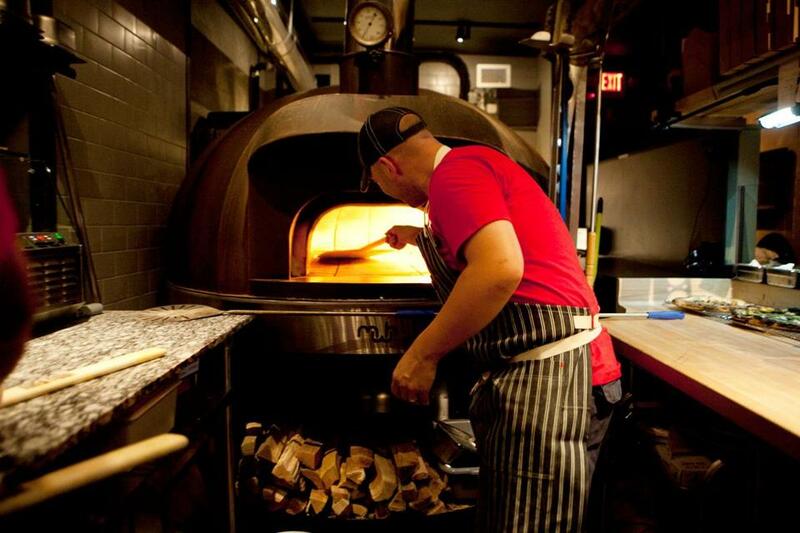 Pies at the 34-seat A4 Pizza in Somerville take three minutes to bake in a wood-fired oven. That is, unless chef Michele (“Mike”) Andolina decides one needs 20 seconds more. One dreamy pizza on a lightly charred, chewy crust — from a starter Area Four head chef Jeff Pond created 14 years ago — comes with shiitakes, fontina, gremolata, and eggs. Andolina cooks the pizza till it’s almost done, then drops two eggs on top and pops it in the oven again until the whites are just set and you can break the golden yolks so they spill onto the cheesy topping. It’s a favorite of the chef, too. This shop is such a Huron Village institution that a nearby corner is named Armando Paolo Square. It’s a tribute to the pizzeria’s gregarious Italian founder, whose family sponsors neighborhood kids’ sports teams — note the trophies that adorn the wood-paneled walls — and has been known to dole out cookies to lingering customers. 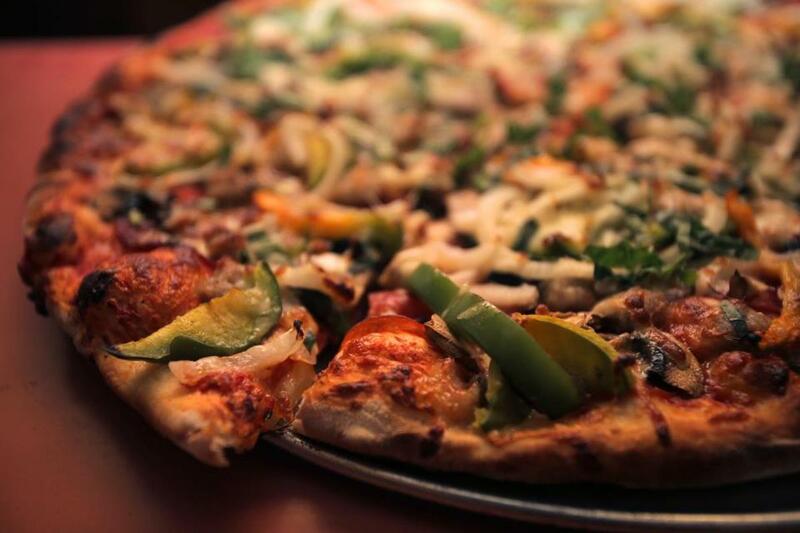 Armando’s also happens to make superb pizza. 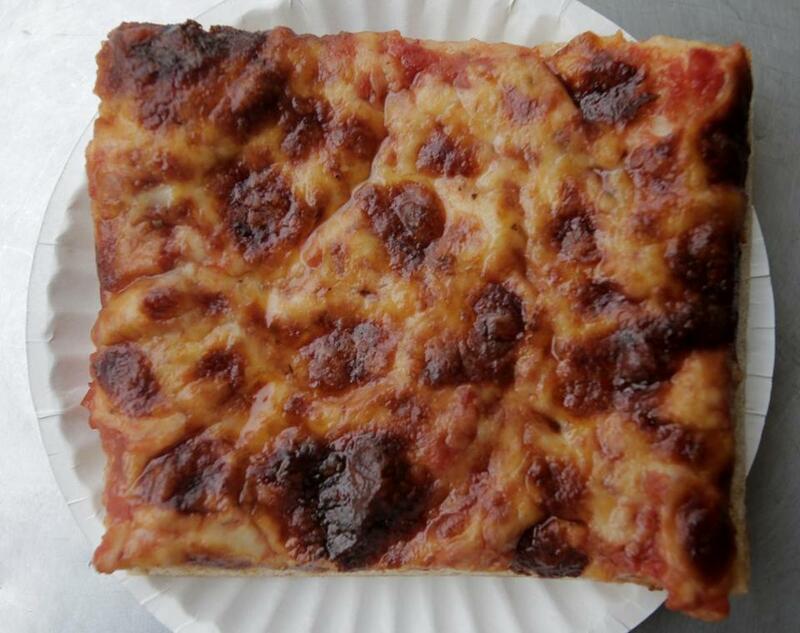 Get hefty charred rectangles of deep-dish Sicilian or a thin-crust version by the slice or pie. Toppings are traditional, and specials are scrawled on paper plates taped to the walls. The only sad faces are on newbies at the register realizing it’s cash only. At Jamie Bissonnette and Ken Oringer’s South End enoteca, friends crowd into close quarters for salumi, pasta, and excellent pizza. Crisp-edged pies from a wood-burning oven come in a handful of variations, from the simple margherita to a white pie adorned with wobbly bits of bone marrow, beef heart, and fresh horseradish. (Tipplers will appreciate the Hang Over ‘Za served at brunch, with bacon, sausage, prosciutto, home fries, and two eggs over easy.) Once warm nights return, share slices and a pitcher of Aperol spritz at an outdoor table and watch the neighborhood go by. Emma’s has been around under various owners since 1962, hopping from Revere to West Cambridge to Kendall Square, with fans following all the while. It’s easy to see why. Cracker-thin crusts are creatively topped and locally named, from The Cantab (bacon, potato, cilantro, dried cranberries, sauce, and mozzarella) to The Click and Clack (artichoke hearts, Kalamata olives, roasted red peppers, sauce, and smoked mozzarella). The cozy, laid-back restaurant is the perfect pre- or post-movie stop. But beware: There’s often a wait for a table. An old-school pizza parlor with few frills, the original Ernesto’s operates out of a tiny storefront on one of the North End’s best eating streets. Part of the appeal is the crust, chewy, springy, and addictive. Then there are the toppings, from regular cheese to eggplant ricotta to chicken ranch. But the biggest draw — literally — is the size of the slices, each a quarter of an 18-inch pie. 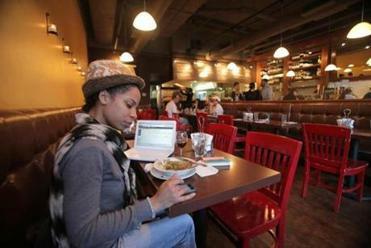 A new location, at Assembly Row in Somerville, also offers gluten-free pizza and smaller cheese slices for the kids. 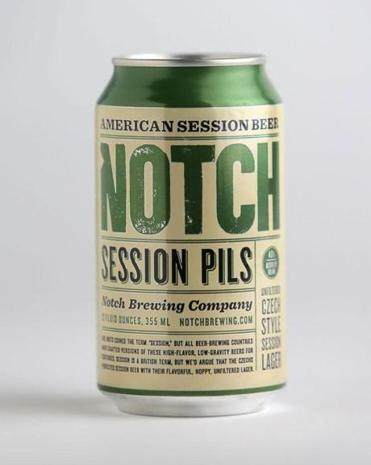 Terrific options from New England breweries to pair with popular toppings. “Organic” and “pizza” don’t often go together, but pies at Flatbread Company are tasty enough to enthrall pizza aficionados yet healthy enough to satisfy picky parents. The dough is made from organic white flour with wheat germ restored, then given just the right kiss of smoke and fire in a wood-fired beehive oven. Kids’ birthday parties are huge on the weekends, perhaps because a 1939 candlepin bowling alley is part of the operation. 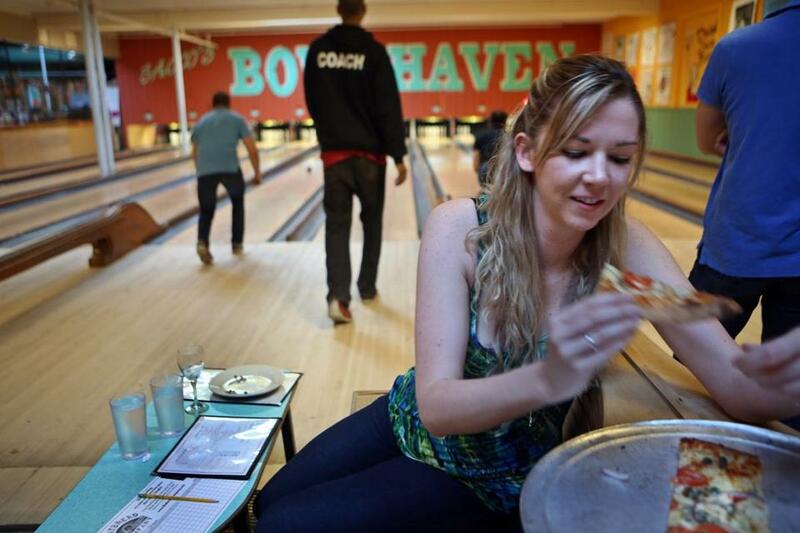 Flatbread Company pizza with a side of candlepin bowling. The wait in the invariably long line at Galleria Umberto is always worth it. You never know whom you’ll meet in line at Umberto, from construction workers with drooping tool belts to neatly attired suburban matrons visiting the old neighborhood. They are the North End cognoscenti who know how to find the easily overlooked entrance. 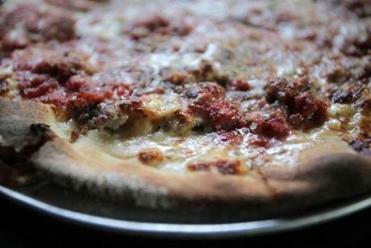 And they know that the wait in the invariably long lines will be worth it for inexpensive squares of thick, gooey Sicilian-style pan pizza to consume at a Formica-topped table, ideally with a bottle of beer or a plastic cup of wine. Diners can also order panzarotti, calzones, or baseball-sized arancini. But the pizza is the point, and it’s been known to sell out before the time Umberto closes the doors at 2:30 p.m. Cash only. The pies at Newton Corner’s tiny Max and Leo’s, owned by identical twins Maximilian “Max’’ Candidus and Pantaleon “Leo’’ Candidus, are cooked in a coal oven that reaches 900 degrees. The thin dough, served blistered and charred, shines best in its simplest form: a margarita pizza, covered with sauce made from tomatoes, mozzarella, and Parmesan. 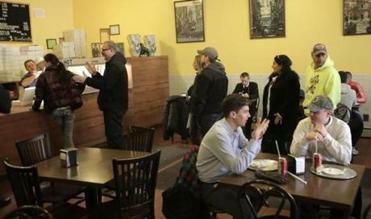 Picco has become a popular South End hangout. There are many reasons to love this South End hangout: warm service, big craft beer selection, and ice cream on the menu. But the best draw? The pizza, of course. It comes with a charred, airy crust, chunky sauce that’s just sweet enough, and unusual toppings like chorizo with pickled chilies, red potatoes, and goat cheese. Strike up a conversation with your friendly server, hoist a slice (and a glass), and top it all off with a bananas Foster sundae or other dessert special. 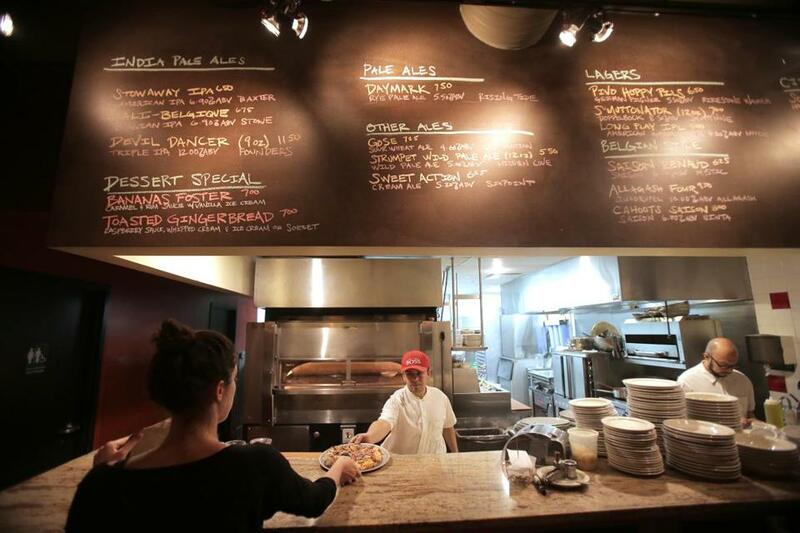 Posto in Davis Square was the first restaurant in these parts to be certified by Associazione Verace Pizza Napoletana as making real Neapolitan-style pizza. The wood-fired oven (which must be no cooler than 900 degrees) guarantees the perfect crust (baked no longer than 90 seconds): thin, slightly chewy, crisp on the bottom, yet flexible enough to fold and eat a libretto. The subtlety of the flavor and texture is best appreciated in the simplest versions, like the marinara with red sauce, sliced garlic, and Parmesan. A view inside the original Regina Pizzeria in the North End. There are Regina Pizzerias popping up all over the place, but the North End original remains the queen of the empire. The 1926 pizzeria works kind of like a lambic brewery — nearly 90 years of yeast development seems to give the dough a slightly sour, complex wheat flavor. 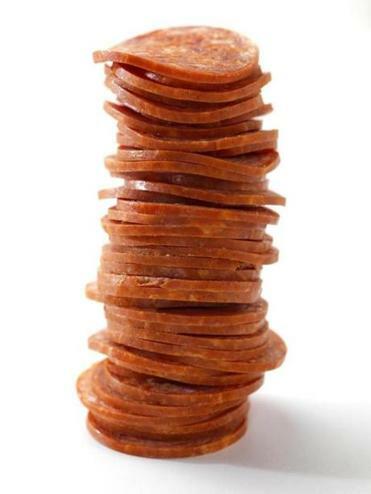 Regina allows diners to adulterate that beautiful dough and sweet-spicy sauce with all manner of toppings, but stick to classics like sausage, pepperoni, or anchovies. The 3-pound Giambotta with everything at Regina Pizzeria. Homemade sausage and garlic pizza at Santarpio’s in East Boston. Boxing memorabilia cover the walls, and the sausage and garlic pizza is about as subtle as a roundhouse punch. Tucked under the Route 1A overpass in Eastie, Santarpio’s dates to 1903 as a bakery (the pizza came later), and the neighborhood guys who wait on you have all been there for decades. Old-school pizza comes out crunchy on the edges, painted with tomato sauce, and topped with just enough melted cheese. For a knockout punch of flavor, ask for extra garlic. 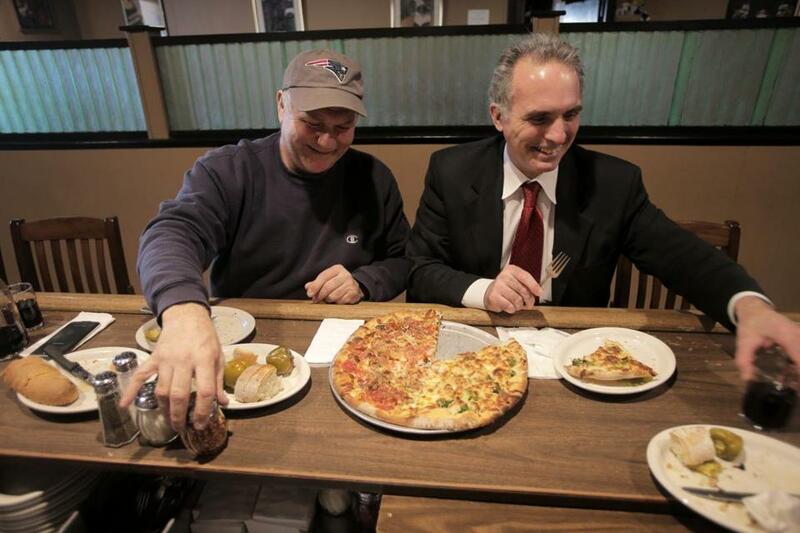 Decidedly old-school pizza is on the menu at Santarpio’s. The folks behind the Foodler delivery app recently analyzed Boston-area orders to reveal our favorite tastes.